If You Could Ask God for One Thing…. Note: the following was delivered as a sermon on Sunday, August 16, 2015 at the Congregational Church in Exeter, NH. There’s a story you may have heard before about two women, and one baby. Both women claim that the child is theirs, and that they are the rightful mother. But one is lying, and it remains up to a wise king to decide which one. The king listens to both women, and comes up with a fair and equitable solution: cut the child in half, and give half to each woman. The king declares that the woman who would rather surrender her child to another than see him hurt is the child’s mother. Because a parent who would see a child destroyed for their own selfishness is no parent at all, but a parent who would willingly relinquish a rightful claim so they child may live? That is love. That is the true parent. That story has been retold through thousands of years in books and plays and movies. But all of those retellings come from this one story, written in Scripture long ago. And it’s the king in the story who gets our attention. The one who orders a child to be divided in half, a horrible and brutal solution. But the king, of course, never has any desire to harm the child. Because he knows that a parent who truly loves a child will never sacrifice that child to their own jealously or greed. And it’s that king’s wisdom that saves the day. The king in this story is King Solomon, sometimes known as Solomon the wise. The Bible describes his wisdom and his discerning mind again and again. It tells us that leaders of other nations, like the Queen of Sheba, sought him out and came to ask for his advice. And he ruled his kingdom as a wise leader, who sought God’s wisdom in all he did. It’s natural to think that Solomon might have been born wise. Maybe he was just a smart, precocious kid with wise parents. But, though he might have been bright, he didn’t grow up surrounded by paragons of wisdom. 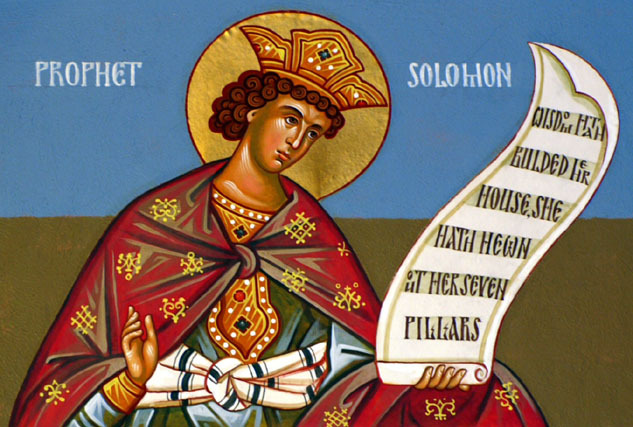 Solomon was the son of David, a great king for sure, but not always a wise one. David was a strong king. He fought Goliath with just a few stones and a slingshot. But he was also a king who had serious lapses in judgement. Like the time he saw Bathsheba sunbathing on a roof, and wanted her so much that he had her husband killed in battle. He was a powerful king, but not a wise one. Think about that question for a minute. God is offering you anything. What do you say? What do you ask for? Money? Fame? Power? Security? Love? All of the above? Or none of the above? Solomon knew that he was in over his head. He was just a young man and he was being asked to lead God’s people, and he was rightfully terrified. And so when God offered him anything in the world, Solomon forgets about money or power or all the rest, and he asks only for this: wisdom. God is so impressed with Solomon’s request that God says, “it’s yours”. And God even ends up giving Solomon all the other things he didn’t ask for, riches and power, because God is loves Solomon for choosing wisdom instead. I love this story because it goes against so much of our popular culture. In a time when we watch reality TV and read about people who are famous for being famous, this story reminds us that the true treasure is never given to those who seek things only for themselves. Instead, it is given to those who go a little deeper than that. People like Solomon, who want the wisdom to do the right thing, not just for themselves but for those they serve. I love the idea of wisdom as a gift from God. Something we can ask for. A spiritual blessing. And something that our world needs now more than ever. I think about the lack of wisdom we have in our culture sometimes. Because wisdom isn’t particularly valued. Success is, in all of its material forms. But not wisdom. Make a million dollars and everyone respects you. Drive a fancy car, or own a big house, and you’ll get noticed. Get the big promotion, and everyone will know you won. But seek only to be wise? Not so much. And I thought to myself, is that what we’ve come to? That being an English major is a mark of failure? And God forbid you are a religion major or a philosophy major. What will you ever accomplish with that? And I thought about how wisdom is not valued in our particular culture. Deep thinking isn’t coveted. Moral questioning is scoffed at, and ethical questions are only considered so long as they don’t impact the bottom line. And young people who choose to devote themselves to the big questions, are met with resistance. But what if we, as people of faith saw the pursuit of wisdom as a part of our spiritual lives? What if we saw seeking knowledge, asking the big questions, and seeking God’s will, as central to the life of faith? I don’t just mean in terms of being book smart. I’ve spent enough time in academic settings to know that can have a PhD and be very smart but also not very wise. I mean in terms of seeking God’s presence and God’s desire for us in our daily lives. I’ve talked before about my love for Reinhold Niebuhr’s short prayer that has come to be known as the Serenity Prayer: God, grant me the serenity to accept the things I cannot change, courage to change the things I can, and the wisdom to know the difference. I think of that prayer not so much as the serenity prayer, but as the wisdom prayer. God, teach me to be wise enough to know what I can do in this world, and wise enough to know what I cannot. Because if I know the difference, I will know your will for me. I will know where to focus my energy. Make me wise, so that I may make this world better. What would it mean if we were to teach ourselves that? What would it mean if we were to teach our children and young people that? What if we taught them that seeking God’s wisdom mattered more than anything? In other words, we have created a culture that is literally making our kids sick and rewiring our children’s brains, and not for the better. And that is because though we may have a culture of smart phones and advanced placement and conspicuous consumption, we are not very wise. We focus on what doesn’t matter first, and on what does matter if we have the time. We do the opposite of what Solomon did. We ask for all the things he didn’t, without asking for the wisdom to know what they are really worth. I think there’s a sweet irony to the fact that Solomon didn’t ask for money or power, but he got them anyway. They came in an organic way, a product of having his priorities in the right place. And that’s how he was able to keep them. There’s an article in this weekend’s Washington Post about happiness, and how to find it. An experiment was done to find what activities helped people to become happy, and maintain that happiness. And the findings were interesting. More than taking classes, playing sports, engaging in civic duties, or even volunteering, participating in a religious community was the most correlated with maintaining ones happiness. I don’t think the goal of coming to church is to be happy. But I think it is to know God, and to seek wisdom of God. And I think that, like Solomon’s wealth and power, our happiness becomes an organic byproduct of that quest for wisdom, and of that desire to know God’s will for our lives. Because I think when we strip away all the stuff of the world, all the “shoulds” and “musts” and desires to get ahead, replace them only with a desire to know God’s will for us, we are reshaped and, in the best sense of the word, re-formed. I think about the young people the book talked about, and the anxiety and stress that they live with, often picked up from watching the adults they love and respect the most. And I think about what our culture would look like if we valued seeking God and God’s wisdom more than seeking anything else. And I think about the two women, and the baby, who came to Solomon. And how one mother was willing to destroy a child to get what she wanted. And the other was willing to let go of everything in order to save them. I think there’s a lesson there for all of us. As individuals. As a church. As a community. As a world. Without wisdom, we will destroy what we love the most. But if we seek God’s wisdom, we will make the hard choices that will allow the next generation to thrive. Today we will go to God in prayer once again. And in a real way I believe God is asking us the same question God asked Solomon: what do you need? Choose your answer carefully. And wisely. Amen. Thank you, Emily! This was a moving sermon, and apt for our times. My most fulfilling conversations and relationships revolve around our shared purpose in life, how can we be a contribution? Question: how would you address this same message to a secular audience? I think we could ask secular audiences what they really are searching for in life. Is it more material things? Money? Or something deeper. Wisdom transcends faith traditions, I believe. I was shocked to read about kids today having stress levels similar to 1950’s psychiatric patients. Not a widely known statistic I think, but an eye opening one. I’ll have to check out that book you mentioned, sounds interesting.